The new freeview film of the month on the Amber website is Amber’s Six to Midnight from 1974. It was originally commissioned by Newcastle City Council, which wanted something about the city. Amber thought it could maybe make the film it wanted to make about the Grainger Market. Nobody ended up happy – the City Council rejected it, unhappy with the meat being unloaded on the streets (‘It may be all right for the Straw Digs generation,’ one councillor commented. There was probably sensitivity about the number of To Let signs on Grey Street. For its part, Amber decided not to try to complicate its work by trying to negotiate other people’s PR agendas. 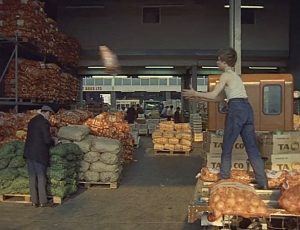 The film ended up on the shelves for years, but, looked at again, it’s a beautiful portrait of the city – a day in its life. 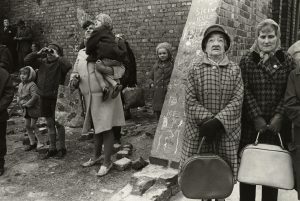 The new featured exhibition, Sirkka-Liisa Konttinen’s River Project, also dates from 1974. The River Project was Amber’s first collective, large scale project. It included Amber’s film Launch, photography by Graham Smith and Laurie Wheatley, visual art by Peter Engel and writing from Tom Pickard and Rodney Pybus. The lack of a venue for the exhibition in Newcastle led to the opening of Side Gallery three years later – forty years ago this year.